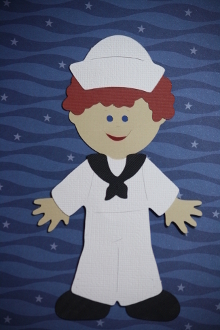 Handmade "Sailor Paper Doll" embellishment with Dress White Uniform. Available choices: Male or Female, choice of skin tone, hair color, eye color, stripes on sleeves. We hand-make every sailor to your specifications with details that make it your Sailor. Approximately 5 to 6 inches tall. All of our embellishments are made paper card-stock that is Acid-free and Lignin free to protect your memories for years to come. It is your memory, make it what you want. This item ships for FREE.